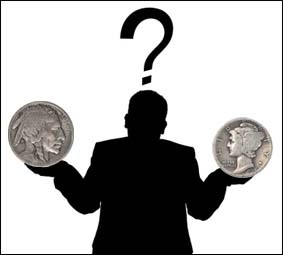 ← American 3-Cent Coin & Nickel: What’s the Difference? “What is my coin worth?” I’ll bet that is the most asked question in numismatics! Unfortunately, it’s a question that doesn’t have an easy answer. The value of individual coins is based on a number of varying factors including rarity, condition and metal content. But more importantly, like all collectibles, the worth of your coin is dependent on what someone else is willing to pay for it. There are no hard and fast rules with collectibles and markets are always in flux. A quick warning before we get started: Collectible coins are wonderfully fascinating and rewarding, but it’s very unusual to find or inherit a coin worth a great deal of money. Like all areas of commerce, the coin market has both wholesale and retail pricing. A grocery store cannot buy bread at one price, sell it again at the same price and stay in business. Everyone needs to buy at one price and sell at a higher price to succeed. Generally, when you sell a coin you are getting wholesale price and when you buy a coin you are paying retail price. The difference in those prices is dependent on many factors including a companies’ overhead, staffing, etc. The guy in his pajamas, on his couch, offering a few coins on ebay might be able to sell at just pennies over his buy price. But other companies that carry a large inventory and produce catalogs need to cover those expenses as well. The first thing you need to get started is to know what coin you have and its condition or grade. We all know the popular phrase in real estate of “location, location, location.” In coin collecting the mantra is “grading, grading, grading.” Generally, the less wear and tear on your coin, the higher its worth. Coin grading is a complicated endeavor with many industry specific terms. Here’s a chart to help you get started. Grading is not a skill learned quickly, but is one that pays great dividends in the world of coin collecting. Consulting an expert or two may be your best bet in this regard. Collectible coins have a “double dynamic” of value when they carry both precious metal content and numismatic interest. But beware, as both of these factors are greatly variable! Owning coins with intrinsic silver or gold worth gives you an increased foundation of value with your collection. Keep in mind that both silver and gold prices can and often do fluctuate quite widely. Two useful resources to get you started are the Redbook (A Guide Book of United States Coins) and the Grey Sheet (Coin Dealer Newsletter). Both of these resources have limitations and serious collectors use them with caution. If doing a lot of research is not for you, try your local coin shop, or even better, attend a coin show. Show your piece to a few people and see what they each have to say about its value. It is crucial to find someone you trust. In this hobby, trust is the absolute most important asset in anyone you deal with. I know this may not be the easy answer to the question “What is my coin worth?” that you were hoping for. But maybe while you’re doing research you’ll discover the thrill of collecting and decide to keep the coin, become a collector yourself and join those of us who find great passion and enjoyment in numismatics. This entry was posted in Uncategorized and tagged coin collecting, Coin value, Collectible coins, What is my coin worth, What is my coins value. Bookmark the permalink. 1 Response to What is My Coin Worth? Thanks for the interesting article about collectible coins. I had no idea that the grading of the coin is important because the less wear, the more valuable it is. Perhaps it could be good to examine several different types of coins so you can evaluate the grading on them better.